As an ABC (Australian Born Chinese), as many like to call it, I have fond memories of helping mum out in the kitchen whenever it was dumpling night at home. She would have the minced filling and wrappers ready on the kitchen bench and we would bond over endless pleating and folding. Mum would then pan-fry the dumplings to make them all crunchy and golden at the base, then finish off with steaming by pouring in a cup of water. I was always so excited because it was a change from the usual rice/meat/vegie combinations that we were used to eating for dinner every night. My brothers and I would have competitions, trying to out-dumpling each other by seeing who could eat the most. Being double my size, they always won, but it goes to say that I did not give up without a tough fight! So, I have a soft spot in me for dumplings (but to come to think of it, who doesn't?). Learning to pleat one properly with even folds is much like riding a bike. Once you've mastered the basic skills, you will always be able to gain back the momentum no matter how long it is between each occasion. The trick is to get yourself into a rhythm, setting up a small bowl with plain water, to dampen the skins, next to the one with the filling, then a large plate to hold all the wrapped morsels. I also find using a blunt knife to transfer the teaspoon of filling onto the dumpling skin works better than with a spoon. Here's a recipe, based on the basics of making Gyoza, which are Japanese dumplings that are traditionally filled with just pork mince, cabbage, chives, garlic and sesame oil. For a twist, add or substitute in other ingredients like fresh chopped prawns, beef mince, chicken, mushrooms, corn, garlic, ginger, leek or garlic chives - just don't forget to increase the seasoning to balance out the flavours! Using your hands, combine the pork, soy sauce, sake, sesame oil, sugar, white pepper, egg, spring onion, coriander and cabbage in a large bowl. Really get your fingers into it to ensure an even distribution of ingredients throughout the filling. Refrigerate for 1 hour. Set up a small bowl with plain water in it. Dip your finger into the water, take a Gyoza wrapper from the stack and wet the edge of one side with your finger. Then place a teaspoon of pork mixture in the centre of the wrapper. Fold the wrapper over, encasing the filling, so that the edges meet to seal the dumpling together. Use your thumbs and forefingers to press around the filling to ensure that all of the air has been removed from the dumpling and that nothing will seep out when you cook it. Then proceed to crimp the edges of the dumpling to ensure a tight seal, working your way from one end to the other. Use one thumb to pleat, and the other to press down on each pleat to hold it in place. If you are preparing a large batch of dumplings, cover the wrapped ones with a wet tea towel to prevent the skins from drying out while you are making more. At this stage, you can freeze any extra dumplings to be consumed another day. Simply place them in a single layer, without touching each other, on a tray into the freezer. 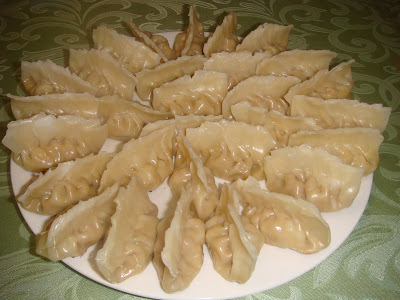 Once frozen, gather the dumplings together into a plastic bag or container. This method prevents the delicate skins from sticking together and tearing when trying to pull apart to cook. Once frozen, the dumplings are best cooked straight from the freezer. This way, the base crisps up more and the ice particles that have formed on the skin help to moisten it and tenderise the dumpling while cooking! To cook the dumplings, heat a dash of vegetable oil in a heavy-bottomed frying pan over medium-high heat. Place the dumplings down in a single layer and allow to cook without touching for 2-3 minutes. Then shuffle them around a little to ensure they aren't sticking to the pan. When the bases are crusty and browned, pour in enough water or stock to come up about 5 millimetres from the bottom of the pan. Cover with a tight lid, reduce the heat to a low-medium and cook for 5 minutes, or until all the liquid has evaporated and cooked the raw meat filling inside. Carefully remove the dumplings from the pan, and repeat the same process with the remaining dumplings. Check out this super old photo of my first ever batch of dumplings!